"A Roadmap to Tackle the Challenge of Antimicrobial Resistance - A Joint meeting of Medical Societies in India" was organized as a pre-conference symposium of the 2 nd annual conference of the Clinical Infectious Disease Society (CIDSCON 2012) at Chennai on 24 th August. This was the first ever meeting of medical societies in India on issue of tackling resistance, with a plan to formulate a road map to tackle the global challenge of antimicrobial resistance from the Indian perspective. We had representatives from most medical societies in India, eminent policy makers from both central and state governments, representatives of World Health Organization, National Accreditation Board of Hospitals, Medical Council of India, Drug Controller General of India, and Indian Council of Medical Research along with well-known dignitaries in the Indian medical field. The meeting was attended by a large gathering of health care professionals. The meeting consisted of plenary and interactive discussion sessions designed to seek experience and views from a large range of health care professionals and included six international experts who shared action plans in their respective regions. The intention was to gain a broad consensus and range of opinions to guide formation of the road map. The ethos of the meeting was very much not to look back but rather to look forward and make joint efforts to tackle the menace of antibiotic resistance. The Chennai Declaration will be submitted to all stake holders. There is a dramatic increase in the prevalence of superbugs, and there is an equal drop in the number of new antibiotics available. The pipeline of antibiotic research and development is nearly dry, especially when it comes to antibiotics active against Gram-negative bacteria. Research and development of any antibiotic is a huge investment for pharmaceutical industry. Lack of profitability has forced pharmaceutical industry to graze in fresh meadows, leaving the field of anti-infective research quite barren. There are major international efforts to tackle the challenge of antimicrobial resistance. ,,, The Indian medical community is seriously concerned about the high resistance rate in our country and would like to partner with Indian authorities in tackling the issue and joining the global fight against antimicrobial resistance. Aim of the "Road map meeting" and "Chennai Declaration" was to initiate efforts to formulate a national policy to control the rising trend of antimicrobial resistance (AMR), after consultation with all relevant stake holders and to take all possible measures to implement the strategy. Increasing antimicrobial resistance is a serious global and regional challenge. There is an urgent need to initiate measures to tackle the scenario and join international efforts to control this menace. The Indian Ministry of Health (MOH) will need to take urgent initiatives to formulate a national policy to control the rising trend of antimicrobial resistance, after consultation with all relevant stake holders and then take all possible measures to implement the policy. The Drugs Controller General of India (DCGI) will need to formulate and implement a policy on rationalizing antibiotic usage in the country, both in hospitals and over the counters, after consultation with stake holders and experts in the field. State Departments of Health will need to take initiatives to improve infection control standards and facilities in hospitals and encourage implementation of regional antibiotic policies, pending formulation and publication of a national policy. Once a national policy is formulated, whole hearted support for this policy by the state DOH is needed for implementation. The Medical Council of India will need to make necessary curriculum changes so as to include a structured training on antibiotic usage and infection control at the undergraduate and post-graduate level. An Infection Control Team (ICT) must be made mandatory in all hospitals. Regulatory authorities and accreditation agencies (NABH, ISO) must insist on a functioning ICT, during the licensing and accreditation process. State Department of Health (DOH) should take initiatives in organizing regional and state infection control committees to supervise the functioning of hospital ICT. A National Task Force should be set up to guide and supervise the regional and state infection control committees. The National Accreditation Board of Hospitals (NABH) is required to insist on strict implementation of hospital antibiotic and infection control policy, during hospital accreditation and re-accreditation processes. Hospitals without compliance with the policy should not be given accreditation. The Indian Council of Medical Research should broaden the antimicrobial resistance surveillance network, incorporating hospitals from both the government and private sector. ICMR will need to provide funds for research on antimicrobial resistance, drug development, and vaccines. The Indian division of the World Health Organization should step up interaction with the government on issues related to drug resistance, antibiotic policy, and infection control. There is an urgent need to standardize Microbiology laboratories in India. Hospitals must have good quality Microbiology laboratory or should be willing to outsource specimens, in the absence of a standardized laboratory. Medical societies to take active interest in initiating infection control and antibiotic stewardship awareness activities among the society members, utilizing the extensive network of local branches of all societies. Medical journals should make deliberate attempts to educate readers on infection control and national antibiotic policy-related issues. Electronic and print mass media should take initiatives on public awareness campaigns on the dangers of misuse of antibiotics. Non-governmental organizations (NGOs) - national and international- have played a pivotal role in disseminating public information and funding research in diseases like cancer and cardiac diseases. They should come forward with similar enthusiasm to tackle antibiotic resistance issue, with the same vigor. There is a need to evaluate the extent and to regulate the usage of antibiotics in veterinary practice. India needs "An implementable antibiotic policy" and NOT "A perfect policy"
Adopt a strict antibiotic policy, with absolute and strict control on antibiotic use in the community and in hospitals, on a background of enforcement of good infection control standards in hospitals? Introduce step- by- step regulation of antibiotic usage, concentrating on higher end antibiotics first and then slowly extending the list to second and first line antibiotics? It is obvious that ban of over the counter (OTC) sale of all antibiotics without prescription will be the ideal step. Currently, all antibiotics including injectables can be purchased over the counter without prescription. It is very easy to issue an order to ban OTC sales of all antibiotics without prescription, but whether such a strict policy could be implemented is questionable. It is debatable whether we have enough drug inspectors and infrastructure to monitor OTC dispensing of all antibiotics. This should be taken into consideration while making any recommendations. An over-enthusiastic approach without proper planning will only lead to failure of the overall strategy and may further affect success of the overall antibiotic policy. A practical approach will be to formulate a list of antibiotics with strict monitoring on the dispensing of these drugs. Step- by- step introduction of other drugs to the restricted list could be tried once the success of the first stage is ensured. Another option would be banning OTC without prescription of all antibiotics in metros and big cities, where there will be no difficulty for patients to consult registered medical practitioners. A more liberal approach in smaller cities and villages, where immediate access to doctors is usually limited, can be utilized. This may not be an ideal approach, but a practical one in the current Indian context. An expert committee should look into these options and adopt the most viable one [Table 1]. Strategy 1: Complete ban on OTC sale of antibiotics without prescription throughout the country. Strategy 2: Complete ban of OTC sale of antibiotics without prescription in metros and larger cities with a more liberal approach in smaller cities and villages. Strategy 3: A liberal approach throughout the country to start with, with an initial list of antibiotics under restriction and addition of other drugs to the list in a phased manner. There is an urgent need to rationalize antibiotic usage in Indian hospitals. Considering the large number of Indian hospitals and their heterogeneity, a nationwide attempt towards this aim will be a huge challenge, but high antibiotic resistance rates in Indian hospitals mandates us to make all efforts to rationalize antibiotic usage. Surveillance on the usage of all antibiotics will be the ideal way to achieve the aim. This may be an impossible task in the current Indian context, considering the lack of resources in many hospitals. Monitoring higher-end antibiotics will be a more practical and implementable strategy. Monitoring should be more vigilant for third line antibiotics active against Gram-negative bacteria, as the antibiotic pipeline against Gram-negative bacteria is nearly empty unlike the situation for Gram-positive bacteria. Strict monitoring on the usage of colistin, currently the most precious antibiotic in an era of increasing carbapenem resistance, must be implemented on an urgent basis. Colistin prescription should be in duplicate, with a copy to be sent to the pharmacy. The prescription must be countersigned by a consultant in 24 hours. In addition, a second opinion by an antibiotic steward within 48-72 hours must be made compulsory. This will allow any doctor to use this life-saving drug in emergencies and at the same time, misuse will be prevented by the compulsory rule of getting a second opinion. Carbapenem and tigecycline (the other higher-end antibiotics with Gram-negative spectrum) usage should be subjected to similar stringent supervision [Table 2]. A similar approach would be ideal in the case of higher-end antibiotics with Gram-positive spectrum (teicoplanin, vancomycin, daptomycin, and linezolid) as well, but may be difficult to implement. A compulsory second opinion may not be a practical and viable option in case of these drugs. However, these antibiotics must be prescribed in duplicate and a copy to be sent to the pharmacy. Infection control committee should monitor these prescriptions at regular intervals and give feed back to the clinicians. The hospital infection control committee should monitor compliance to the surgical prophylaxis policy. Pharmacy should keep track on the usage of higher-end antibiotics and should provide a daily list to the infection control team. The infection control team should follow-up the cases on a daily basis, discuss with the antibiotic steward, and give feedback to the primary consultant. Availability of standardized Microbiology laboratories is limited to bigger hospitals and major cities. Measures should be initiated to expand the network of accredited laboratories. In order to overcome the problem of financial constraints in a resource-limited setting, low-cost diagnostic methods and rapid bedside diagnostics should be explored. Department of Health and Indian council of Medical Research (ICMR) should establish a national antibiotic resistance surveillance system with representation from all regions in the country. Government and private hospitals, hospitals of varying bed strengths and facilities should all be included. Such data will be useful to initiate targeted efforts to tackle resistance, formulate and modify national and regional antibiotic policies. Periodic publication of collated data in a key national journal will serve as a benchmark for antibiotic usage and resistance load in hospitals. Ministry of Health should take urgent initiative to formulate a national policy in order to control the rising trend of antimicrobial resistance, after consultation with all relevant stake holders and take all possible measures to implement the strategy. National antibiotic policy must have generic domains of agreement but should be subject to local adaptation depending on resistance patterns and resources. Department of Health (DOH) to make regulations to reinforce infection control measures in all hospitals. DOH to support, through the development of a national network, surveillance of AMR (Antimicrobial Resistance) and consumption and quality of prescribing. As resource constraints may be a major obstacle in a developing country like India, we can start with a few key pathogens and antibiotics and later expand to include a broader list of pathogens and antibiotics. DOH to conduct public awareness campaigns through media and encourage private organizations to conduct similar campaigns. Encourage research to develop new antibiotics and vaccines. Accreditation of hospitals must be made mandatory. DOH working in close collaboration with the insurance industry, represented by Federation of Indian Chamber of Commerce and Industry (FICCI), to lay down standard treatment guidelines for diseases after consulting with national experts (including proper antibiotic use), which will be linked to third party payment for the hospitalized patients. Urgent measures are needed to regulate over the counter sale of antibiotics (OTC) and rationalize in-hospital antibiotic usage, especially higher-end antibiotics. DCGI has a significant role to play in the initiation of the OTC regulation. Though this is a major challenge, there should not be any delay in initiation of serious efforts. All hospitals must have an infection control committee and an antibiotic policy and should initiate or augment efforts towards implementation. Those hospitals with an existing ICC and an antibiotic policy should augment efforts to increase compliance to the policy. Hospitals without a policy must initiate efforts to formulate an ICC and an antibiotic policy. ICC should define an annual target for achievement. Hospital accreditation agencies can assess the compliance to the policy. All hospitals must have an infection control team, under the leadership of an infection control consultant, who can be an infectious diseases specialist, a microbiologist with training in infection control or a physician of any specialty with training in infection control. The committee should include all major stake holders including medical superintendent, general manager, housekeeping supervisor, operation theater in-charge, chief executive officer, medical director, and representatives of major departments. Wholehearted support of the hospital management is essential for the effective functioning of ICT. 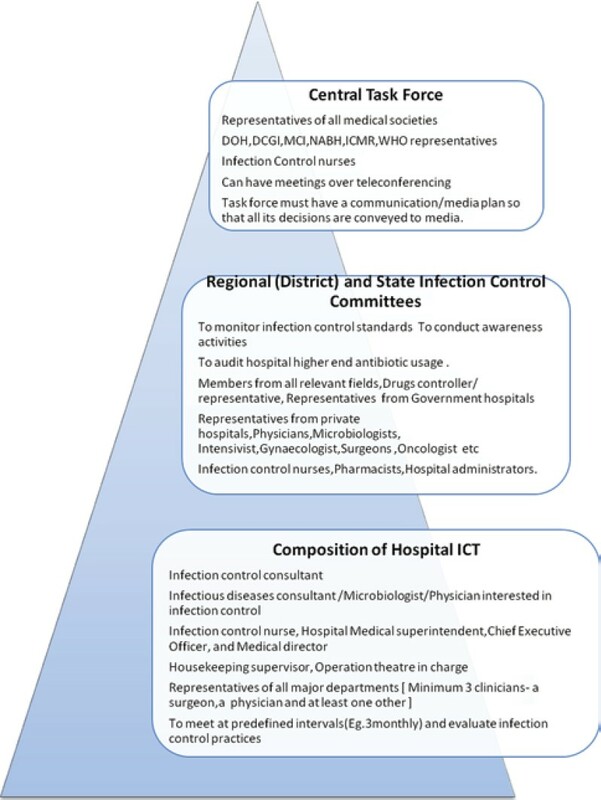 The committee should meet at least once in three months and discuss important infection control issues like the level of compliance to antibiotic policy, antibiotic resistance pattern (antibiogram), and the compliance to infection control guidelines [Figure 1]. An antibiotic steward is a physician who is trained in infectious diseases and infection control or a microbiologist with training in infection control and antibiotic stewardship. In hospitals without an ID physician or microbiologist, any clinician with special interest in infection control and antibiotic stewardship can function as an antibiotic steward. Antibiotic steward should be responsible for giving a second opinion on higher-end antibiotic usage. Availability of more than one antibiotic steward in any one hospital will provide flexibility and choice. Regional infection control committees could be established to assist and supervise the infection control activities in the region. All hospitals in the region, both government and private, should be under the guidance of the regional committee. Regional committee can look into the infection control quality monitors, higher-end antibiotic usage, and other infection control and patient safety-related issues. The committee can meet once in 3-6 months. A central task force should be formed to supervise the infection control and antibiotic stewardship activities at a national level. Task force should include representatives of all major stake holders. Regional and state infection control committees can report to the central task force. Presence of state task forces can bridge the activities of the regional committees with the central task force. Microbiology laboratories and Microbiologists have to play a very crucial and integral role in the implementation of the Roadmap and the national policy. Lack of standardization of Microbiology laboratories is a serious issue, which needs urgent attention of the policy makers. Microbiology labs should issue hospital antibiogram at pre-defined intervals. Those hospitals without good laboratory support should be willing to outsource samples to better laboratories. The system of notification of communicable diseases is a popular, established, though not strictly followed system in the country. Multidrug-resistant bacteria, especially pan-drug-resistant bacteria, must be considered as a notifiable entity. Such a reporting system should complement national antimicrobial resistance surveillance studies. Indian Microbiologists should expand their role from the conventional Microbiologist working in a laboratory to an active player in directing interventions in the prevention of HAIs, deciding antibiotic policy and authorizing use of reserve antibiotics, planning and strengthening of diagnostic facility, choosing rapid, sensitive, and specific diagnostic tests, and monitoring antimicrobial resistance [Table 3]. Hospital Microbiology laboratories should follow standard protocols for susceptibility testing. Must generate and distribute antibiogram at regular intervals (Quarterly). Hospitals to send antimicrobial susceptibility testing (AST) to standardized labs to avoid erroneous reporting of organisms and their susceptibility pattern. Pan-drug-resistant Gram-negatives, carbapenem-resistant Gram-Negatives, Vancomycin- resistant Enterococcus and MRSA should be made notifiable. National accreditation board of hospitals can play a very significant role in implementing infection control and antibiotic stewardship policy in Indian hospitals. There is no published data on the level of compliance of NABH accredited hospitals to the antibiotic policy and infection control guidelines. NABH should formulate more efficient ways of assessing the compliance to the guidelines. NABH to insist on strict implementation of hospital antibiotic and infection control policy, during hospital accreditation and re-accreditation processes. Authors do realize that during NABH accreditation process, assessment on the compliance to infection control policy and infection control practices is only one of the 636 elements to be covered. Additional importance must be given to the infection control part. NABH should consider issuing an advisory towards the seriousness of the antibiotic policy and following it up with all sincerity. Additional time should be allocated for the infection control and antibiotic policy surveillance. One of the main reasons for the inappropriate antibiotic usage by Indian doctors is the lack of adequate training on the subject during undergraduate and post-graduate courses. This deficit in the basic training can only be overcome if there is a change in the curriculum. Structured training in antibiotic usage and infection control should be introduced in both UG and PG curriculum. Post-MD/DNB (Internal Medicine) sub-specialization in Infectious Diseases, (leading to DM/DNB) should be introduced in all post-graduate centers that offer sub-specialty training. MD microbiology: Compulsory training in infection control and antibiotic stewardship. Infectious Diseases training in UG and PG curriculum in all specialties. Antibiotic stewardship and infection control one week rotation-3 rd , 4 th , and final year MBBS. Teachers should be role models to their students in wise and appropriate antibiotic usage. All efforts should be made to educate and stimulate students and young doctors to follow infection control practices. Teachers as role models of rational prescribers. Undergraduate examinations- questions on principles of good antibiotic practice in theory, viva, and practical examinations (in all specialties). Rational prescribing practices should be introduced early in the curriculum. Problem-based learning and case studies on antibiotic prescription and infection control. Concepts to be reinforced during CRRI (Compulsory Rotational Residential Internship) and PG courses. Emphasis on making accurate diagnosis (clinical, microbiological) and then prescribing antibiotics, thereby limiting empiric therapy. Role of an individual physician - In the end, in spite of all the regulations in place, given the immense size and heterogeneity in the health care delivery, antibiotic control will depend on the wisdom of a physician or a surgeon at the patient's bedside, in the clinic or at home. State Department of Health and the Directorate of Medical education should take very active initiatives in implementing the national antibiotic policy and the curriculum change recommended by the MCI. Support establishment of infection control committee in all medical college hospitals. Regular CMEs on proper antibiotic usage. Antibiotic policy for all medical college hospitals. Implement the curriculum changes recommended by MCI. Encourage research (thesis) and publication on infection control and antibiotic stewardship related issues. Antibiotic usage auditing (monthly) in all teaching hospitals. Help establish a district infection control committee. Organize fund for antibiotic stewardship training. Induction training and periodic training courses on antibiotic usage for health care staff. Stress on infection control in government hospitals. Encourage usage of alcohol hand rub between patient contacts. World Health Organization should play an active role in tackling antibiotic resistance. WHO should co-ordinate initiatives in various countries, provide technical support, and organize awareness activities. Microbes are global citizens; their spread across the earth not being restricted by the national boundaries or national flags. If we intend to challenge microbes and tackle the situation, we have to pursue the behaviour and tactics of bugs, by becoming global citizens and thinking beyond national boundaries. High quality infection control set-ups in developed countries may not be fruitful unless countries with high resistance rates and less stringent infection control facilities take serious measures to control resistance. WHO can play significant role in helping countries who lack resources to upgrade the laboratory facilities and infection control standards. Indian division of the World Health Organization should be proactive in tackling resistance initiatives and interact with the government on issues related to drug resistance, antibiotic policy, and infection control. WHO to take initiatives in establishing an international fund to tackle resistance to help resource-limited countries in setting up infection control facilities. Provide technical and monetary help in tackling AMR initiatives. Augment WHO led educational activities for medical community and the public. 'Road map meeting' and the 'Chennai Declaration' are the typical examples of the willingness of medical societies to work together for a common cause. Medical societies in India always took active interest in public health issues and have made significant contributions in all initiatives. Even though the issue of antibiotic resistance existed for long time, serious discussion on the subject started only in recent years. Medical societies were quick to respond to a call for a joint initiative and communicate with authorities offering co-operation and support to a national antibiotic policy. Medical societies should disseminate policy decisions to all society members through society journals, conferences, Continuing Medical Education (CME) activities, newsletters, and website. Action plan of all societies for the coming year - Spreading message on rational usage of antibiotics and infection control. Encourage members of the society to attend short courses to qualify to be an antibiotic steward. Dedicated sessions on infection control and antibiotic stewardship in society conferences. Society conferences will have dedicated sessions on tackling resistance. Engage with media in a positive manner. Journals must make deliberate attempt to educate readers on infection control and national antibiotic policy-related issues and publish more articles on the subject of antibiotic stewardship and infection control. A joint meeting of journal editors to implement this agenda should be explored. International media have played a significant role in the success of public awareness activities on the danger of overuse of antibiotics. Indian media should follow similar examples and help authorities and medical societies to make tackling resistance efforts a big success. Media should take initiatives in public awareness campaigns. Newspapers can publish articles to educate public on the danger of overuse of antibiotics. Media should disseminate information on the "Bad bugs, no drugs" concept. Visual media should broadcast programmes and news on the danger of overuse of antibiotics. Media should avoid sensationalism and increase awareness. Veterinary antibiotic usage as a growth promoter or for prophylactic and therapeutic indications is a major contribution to the resistance scenario, as majority of these antibiotics are also used for disease control in humans. There are clinical and epidemiological evidences that resistant bacteria or resistance determinants might be passed from animals to humans directly or indirectly via food, environment, or during animal husbandry practices. Some countries report that more than 50% of their total output of antimicrobial compounds is used in agriculture, and most are applied to food animals in sub-therapeutic doses as growth promoters. The magnitude of veterinary antibiotic usage is not well-studied in India. Therefore, there is need to emphasize on the following aspects. Need to evaluate the extent of antibiotic usage in the veterinary practice and the indications of use (Prophylaxis, treatment, or growth promoter). Need to regulate antibiotic usage in the veterinary practice. Need to ascertain and monitor the prevalence of resistant bacteria, especially important zoonotic food-borne bacteria in animals and food of animal origin to quantify the rate of transfer of medically-relevant resistance genes and resistant bacteria from animals to humans. Regular monitoring of residues of antibiotics in food of animal origin and study the role of antibiotic residues in food towards development of résistance. Formulation/implementation of proper regulations for observance of withholding or withdrawal periods between the use of antibiotics and animal slaughter or milking to avoid residues of antibiotics in milk and meat. A designated "National Antibiotic Awareness Day" will help in propagating the importance of tackling antibiotic resistance among health care workers and the public, giving opportunity to all stake holders to appraise their previous work and plan future activities. Where does the road map head? "Road map meeting" decisions - The "Chennai declaration" will be submitted to all sectors of the relevant governmental and non-governmental bodies, medical societies, and all major stake holders. The road map should form the template for regional and local framework for combating AMR. Progress with the implementation of the Road map will be assessed annually by a joint committee during the annual conference of one of the participating medical societies. Road map committee of medical societies will communicate with all stake holders to collect data on the progress. The central task force can categorise the recommendations into major and minor on priority basis, assess the progress of implementation and the compliance by all stake holders. The road map will be a dynamic process, subject to further adaptation with time, experience, and maturity. Formulation of a national policy to combat antimicrobial resistance. Initiation of efforts to implement major components of the policy. Sixty percent compliance rate to major recommendations by all stake holders. Compliance rate to reach 70%. Initiation of efforts to implement minor components of the policy. India achieving the status of a country with a functioning antibiotic policy despite limitations. More than 90% compliance rate to major and minor components of the policy. India achieving the status of a country with a functioning antibiotic policy comparable to those countries with high quality infection control and antibiotic policy compliance rates. Serious concern about the rising trend of antimicrobial resistance in the country has prompted medical societies to hold the joint "Road map meeting" in order to seek practical, implementable solutions to the problem. We have considered the Indian scenario on the ground before making the recommendations. We believe that if we have the will and resolve, the "Chennai Declaration" targets can very easily be achieved. The opinions expressed in "Chennai Declaration" are those of the authors. The opinions do not reflect in any way to those of the institutions, to which the authors are affiliated. We express our gratitude to the governmental bodies like DCGI, MCI, NABH, ICMR, and World Health Organization for participation in the "Road map meeting," but the opinions expressed in "Chennai Declaration" do not, in any way, belong to these organizations. We also express our gratitude to the international representatives for their participation in the meeting and sharing their experience. 1. Dr. Margaret Chan, Director General-World Health Organisation. Available from: http://www.who.int/world-health-day/2011) [Last accessed on 2012 Nov 15]. 2. Appelbaum PC. 2012 and beyond: Potential for the start of a second pre-antibiotic era? J Antimicrob Chemother 2012;67:2062-8. 3. Boucher HW, Talbot GH, Bradley JS, Edwards JE, Gilbert D, Rice LB, et al. Bad Bugs, No Drugs: No ESKAPE! An Update from the Infectious Diseases Society of America -IDSA Report on Development Pipeline. Clin Infect Dis 2009;48:1-12. 4. Available from: http://ibnlive.in.com/news/antibiotic-policy-put-on-hold-indefinitely/192878-17.html. [Last accessed on 2012 Nov 15]. 5. Available from: http://www.dailypioneer.com/nation/10933-lack-of-foresight-antibiotic-policy-bites-dust.html [Last accessed on 2012 Nov 15]. 6. Rathnakar UP, Sharma NK, Garg R, Unnikrishnan B, Gopalakrishna HN. A study on the sale of antimicrobial agents without prescriptions in pharmacies in an urban area in South India. J Clin Diagn Res 2012;6:951-4. 7. SaradammaRD, Higginbotham N, Nichter M. Social factors influencing the acquisition of antibiotics without prescription in Kerala State, South India. Soc Sci Med 2000;50:891-903. 8. Taneja N, Singh G, Singh M, Sharma M. Emergence of tigecycline and colistin resistant Acinetobacter baumanii in patients with complicated urinary tract infections in north India. Indian J Med Res 2011;133:681-4. 9. Mohamudha PR, Harish BN, Parija SC. Emerging carbapenem resistance among nosocomial isolates of klebsiella pneumoniae in South India. Int J Pharm Biol Sci 2010;51:1-11. 10. Tayade A, Ghafur AK, Gopalakrishnan R, Priyadarshini K, Thirunarayan MA, Ramasubramanian V, et al. ABS121/12-Clinical profile of patients with colistin resistant Gram negative infections, CIDSCON. 2012. 11. Sarma JB, Ahmed GU. Infection control with limited resources: Why and how to make it possible? Indian J Med Microbiol 2010;28:11-6. 12. Wattal C. Prescription auditing of Antimicrobials. Microbiology news letter, Sir Gangaram Hospital. 2012;18:37. 13. Jaggi N, Sissodia P, Sharma L. Control of multidrug resistant bacteria in a tertiary care hospital in India. Antimicrob Resist Infect Control 2012;1:23. 14. Ghafur A, Nagvekar V, Thilakavathy S, Chandra K, Gopalakrishnan R, Vidyalakshmi PR. Save antibiotics, save lives: An Indian success story of infection control through persuasive diplomacy. Antimicrob Resist Infect Control 2012;1:29. 15. Second NABH Assessors Conclave at New Delhi and Bangalore in Dec 2010 and Feb 2011 and data presented by the NABH representative to the ′Road map meeting". 16. Ghafur A. Can India be the wing commander in the global fight against antimicrobial resistance? J Assoc Physicians India 2012;60:42-3. 17. Available from: http://ecdc.europa.eu/en/EAAD/Pages/Home.aspx/ [Last accessed on 2012 Nov 15]. 18. Available from: http://www.e-bug.eu/eng_home.aspx?cc=engandss=1andt=Welcome%20to%20e-Bug [Last accessed on 2012 Nov 15]. 19. Available from: http://www.parliament.uk/edm/2010-12/2418 [Last accessed on 2012 Nov 15]. 20. Carlet J, Rambaud C, Pulcini C. WAAR (World Alliance against Antibiotic Resistance): Safeguarding antibiotics. Antimicrob Resist Infect Control 2012;1:25. 21. The Medical Impact of Antimicrobial Use in Food Animals. Report of a WHO Meeting. Berlin, Germany, 13-17 October 1997.